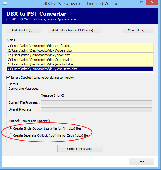 PCWin Note: DBX to PST Converter 2.0 download version indexed from servers all over the world. There are inherent dangers in the use of any software available for download on the Internet. PCWin free download center makes no representations as to the content of DBX to PST Converter version/build 2.0 is accurate, complete, virus free or do not infringe the rights of any third party. PCWin has not developed this software DBX to PST Converter and in no way responsible for the use of the software and any damage done to your systems. You are solely responsible for adequate protection and backup of the data and equipment used in connection with using software DBX to PST Converter. Doxillion Plus Mac PDF Converter - Doxillion is a Mac PDF file format converter to convert docx, doc, rtf, html, wpd, odt, txt and other text file formats. Convert a single file or batch convert several PDFs at a time. Convert .DBX to .PST - To convert emails from Outlook Express to Outlook, the .DBX to .PST converter is reliable method that has all smart features to properly convert .DBX files to Outlook 2013, 2010, 2007, 2003, 2000, etc. Convert .DBX to .PST Files - Get Outlook Express to Outlook Converter that is advance to convert .DBX to .PST Outlook 2013, 2010, 2007, 2003, 2000, etc. The .DBX to .PST Tool would save attachments, formatting, unread status, header information, etc. Convert DBX to PST - Use DBX Converter to Import DBX to PST in batch by following easy and simple GUI. Convert DBX to PST with all emails properties like-meta data, formatting, attachments, contents etc. kept intact. How to convert .dbx files to Outlook - For knowing about how to convert .dbx files to Outlook, get DBX to PST Converter that is successful solution for Converting Outlook Express to Outlook (2013, 2010, 2007, 2003 & 2000 etc). Convert EDB File - Use EDB file to PST converter software you can easily convert EDB file to PST file at one go. EDB file exporter utility is the best process to export data from EDB file into PST file without facing any problem. ATOYOU WMV to Video Converter - Atoyou WMV to video converter is a great WMV video converter which can convert WMV to videos like WMV to avi, WMV to mp4, WMV to flv,etc. In fact, this WMV to video converter can help you convert WMV file to all popular videos. Doxillion Plus PDF Converter - Doxillion is a PDF file format converter to convert docx, doc, rtf, html, wpd, odt, txt and other text file formats. Convert a single file or batch convert several PDFs at a time. DBX to PST - DBX to PST Converter tool is designed to convert .dbx to .pst, dbx to pst, dbx to outlook. Convert multiple DBX files to PST file friendly with Outlook 2010, 2007, 2003, 2002, 2000 in single conversion cycle using DBX to PST Program. OLM to PST Converter Now - Mac (OLM) files to PST of Belief. OLM to PST Persona is a differentiated telecommunicate artefact for the transmutation of OLM files to PST. Outlook Express to Outlook Converter - The Outlook Express to Outlook Converter utility is prompt method to convert DBX files to Outlook 2010, 2007, 2003 and also 2013. The tool would be able to supports batch approach for quick emails conversion. IncrediMail to Mac Mail Converter - Do you need to convert IncrediMail Mac Mail? Then donâ€™t waste the time and get the IncrediMail Converter tool that could efficiently convert IMM files into Mac Mail. It easily supports entire attachments. .DBX to .PST - To import .DBX data from OE into .pst than you can try .DBX to .PST Conversion tool that can easily import Outlook Express .dbx to Outlook. It supports batch facility to import multiple .dbx files to .pst at a time. Convert Incredimail Emails - Incredimail Converter is an apt tool to move, import, convert Incredimail emails to Outlook, Windows Mail, Windows Live Mail. With this tool, users can convert Incredimail emails with attachments, formatting, read/unread status etc. Convert IncrediMail to Thunderbird - Get quick solution to smartly convert IncrediMail to Thunderbird with attachments. The software can convert multiple IMM files to Thunderbird in one time through Batch mode. IncrediMail to MBOX Converter - You can try IncrediMail to MBOX Converter for converting IncrediMail files into Thunderbird, Mac Mail, Entourage or Eudora with original email formatting. It easily works on all Windows OS- Windows (XP, Vista, 2003, 7 & 8 etc). Outlook Express to Outlook - Get the perfect emails conversion from Outlook Express to Outlook through the DBX files to PST Converter that would convert multiple DBX files into Outlook at once. Converting emails from Outlook Express to Outlook - For Converting emails from Outlook Express to Outlook just go with the DBX files to PST Converter tool that is wonderful solution to convert OE emails to Outlook 2013, 2010, 2007, 2003, 2000, etc. Thunderbird to Windows Live Mail - To convert Thunderbird to Windows Live Mail, try Thunderbird to Windows Live Mail Converter. The software provides you absolute solution to convert Thunderbird into live mail with all header information.